oh yeh Golan heights is annexed , with its Druze population , with its traffic among all those that lived there for thousands of years . And you ask are they all out of their mind ? or its a justice for all move? Now let us return all the annexed lands of Mexico , like Texas , LA, New Mexico and others . Reason USA will loose those places either was within 30 years , if it will even exist that long to a population exchange . For Israelis its a good day , but its sad , since they will fight another war just for this one. Mexico is another made up flag stamp and banknote fantasy. This will cost the Zionist colonial project all of it’s stolen territories around the world. Mexico lost Tejas because – like Syria – it used the territory to attack ranchers there. Syria lost Golan because it used the highlands to attack Israel in ’67. When hegemons use lands to garner tactical advantage over another sovereign, they run the risk of losing the lands. And I’m happy the aggressors met with a force they didn’t expect. Lesson learned. Speaking of lessons, take a few English lessons! You need them if you hope to make sense. This is a good move. Israel has had sovereignty over the region longer than any other nation since the creation of nation states in the region post Sykes-Picot. The concept of self-determination also would support this move: the Golan residence would prefer Israeli control. No peace treaty with Syria was ever signed- the war between the two countries remains. It would be insane for Israel to give up strategic territory like the Golan to an active enemy. This picture, with Netanyahu with tears in his eyes, is to cherish and respect for the efforts this man made all along his carrier. He’s a real hero. A great man. The Man. Hats off for Netanyahu! 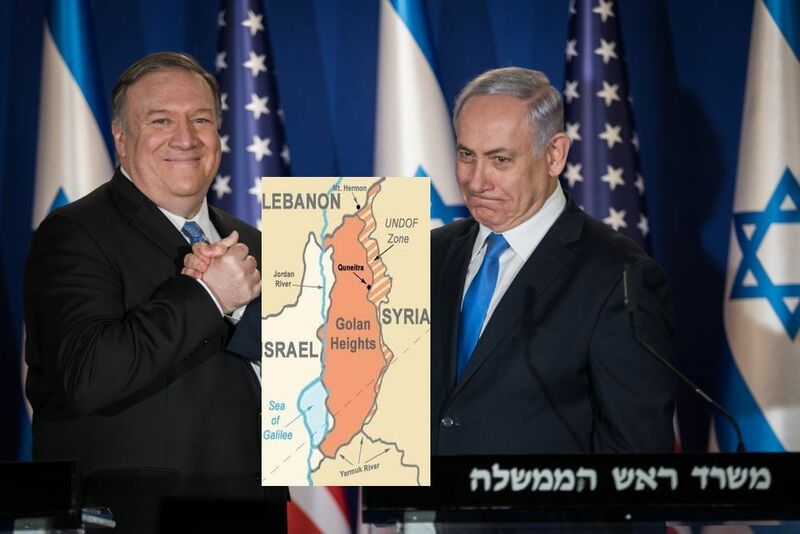 Netanyahu should thank to mister Big Ayatollah Ali Khamenei , because we have to recognize, Iran’s stirring up all the conflicts and Middle East has surely contributed to the right decision regarding Golan. And enacted on the day of Purim, representing a slap to the modern day Haman – the Ayatollah of modern day Persia which is Iran. Now President Trump is emulating both King Cyrus and King Xerxes I the Great (King Ahasuerus). And according to the internet website http://www.geni.com , the Persian King during the time of Queen Esther and Purim, King Xerxes I the Great – King Ahasuerus – his 75th great grandson is Donald J. Trump the 45th President of the United States of America (who is acting like both King Cyrus and King Ahasuerus)! Surely God is in all of this! The hand of God has manifested once more, there are no words to describe the greatness of his miracles. You Israelis are indeed the chosen people, there is no doubt! stop with that non sense,there are 100 billions galaxies,each galaxy has 100 billion stars,each star has numerous planets,and you think there a choosen people? of course chosen. but only in the Solar system… maybe other chosen in other worlds. Why such a small population of “chosen” people? 13.5 Million. when Islam has i.3 Billion same as the Christians and same as China and India. Wow between the 4 of them they have 5.2 Billion and there are only 6.5 Billion humans on Earth. Thats 80% of world population. That leaves 6.5-5.2 = 1.3 Billion. What religion are they? Why are they not chosen. I think my numbers are wrong. I think there are more than 1.3 Billion in each group. so maybe someone else can figure this out. Looks like I got lost in my ramblings. hahahaha. well anyway, reading so many idiotic posts will drive anybody to drink…. Go about half way down that page and you will see the reference to President Donald J. Trump. Thank you Adam. I found it this time. That is unbelievable. I’d like to know how they can verify such a connection? If it was possible to prove 100%, just simply astounding. It would get a LOT of people thinking, and perhaps change their course. I love this man, our president. As an American Jew I could not be any more proud of my vote. Now my cousin, convince your family, friends & neighbors! What remains is for Jewish Zionist Israelis to accept the spotless lamb “Yeshuah” as their eternal sacrifice, once for all your sins. – It is not possible that the blood of bulls and of goats should take away sins. – God will provide himself a lamb for a burnt offering. Although national Zionist Israel will not accept Yeshuah as its messiah until the time of Jacob’s Trouble, many individual Jews will – and already have. Shalom and peace, my cousins! Mr. Gray – take your proselytizing somewhere else. Jews know full well jesis was a false prophet. Jews by the thousands turned to him. Happily. But if you’re happy in your guilt and darkness then by all means stay there. Your support and encouragement are most welcome, but please keep your false Replacement Theology comments off this site. Keep reading the unaltered versions (Mesorah) of the Torah, all 24 books. If your Holy Spirit (Ruach haKodesh) shows you another more true path, and you follow it, you will be truly blessed. Tehillim 44:14 (15) Thou makest us a mashal (byword) among the Goyim, a shaking of the rosh among the peoples. Yirm 24:9 And I will deliver them for abhorrence, for an offense to kol mamlechot ha’aretz to be a reproach and a byword, a taunt and a kelalah (curse) in all places where I shall drive them. The time will come when the Jews will look on the wounds in Jesus’ hands from the day of his crucifixion and will weep. While not a Jew nor an Israeli, . . . I support both 100% in their struggle for their homeland. Personally would like to see them kick the rest out permanently, . . . set up a strict border, . . . and become a mecca for tourists from the world around who want to learn about God’s country and his Son, Jesus. President Trump is the BEST President ever. He keeps his promises wherever he goes. God Bless the Trump family. God Bless Israel. The Dotard proclaims the Golan part of Occupied Palestine, just like he proclaimed Guido president in Venezuela. Wrong side of history, Dotard. Again. The world laughs at impotent words. The World Is Laughing At you. So will the Prince of Peace when He returns. Fascism by Twitter does not work. Thanks for pointing out the absurdity of your remarks. Twitter does not work for fascism. But it does work to get out a presidents message when the left wing media won’t. President Trump did not “proclaim” anything. He RECOGNIZED realities. One, that Maduro retained his office through fraud, is illegitimate and will soon be gone, and two, that Israel – the de facto government of Golan – is now its de jure government, and three, that Jerusalem is Israel’s eternal capital. Get used to all three. They are reality. Who will the Dotard appoint as Prince of Peace? may HE continue protecting and preserving your health, wisdom and courage ! President Donald J. Trump should be consecrated the King of the world. Amen. No doubt, if Trump were POTUS during WWII, he would have had the Army Air Force’s B-17s and B-24s continuously bomb the rail transit points and rails themselves whose destination was the concentration and extermination camps. These targets were lightly to not anti-aircraft and fighter aircraft defended by the Germans. Add that bombing the camps themselves, though creating casualties who would have died, and did die regardless, would have halted the extermination. It’s a day for History … God bless the United States, Long live Israel! May the God of Abraham, Jacob and Moses protect the Jewish State. Undoubtedly, Donald Trump is the best president that the United States of America ever had. Es un día para la historia … Dios bendiga a los Estados Unidos, ¡viva Israel! Que el Dios de Abraham, Jacob y Moisés proteja al Estado judío. Sin lugar a dudas, Donald Trump es el mejor presidente que han tenido los Estados Unidos de América. Wow, this is one of the world’s most important announcements and the issue that also brought Russian and the US into alignment in the Mideast. This is fantastic. We are witnessing one of the best moves in history. I hope Lebanon can shake the Hizbollah curse the regain its sovereignty. 1- all viable Democratic presidential candidate is boycotting the AIPAC March 22 conference – yippee! Trump does not say “When Trump says America is Anti-Israel and Anti-Jewish – what he actually means is America is ‘Anti-Kahanist and Anti-Apartheid’ – which is a very good thing. Anti-Semitism is highly welcome here, why not, if they keep annexing other people’s land. Trump would have recognised the occupation of European countries in Nazi time if he was the president of US then. Thanks to Zionist supporting Trump and other right wing governments in the world, the right winger are attacking Jewish cemetries and the right wingers in Israel even advocating facism in so called Jewish state.